Germany and Iran have signed a range of business deals in what is expected to take economic relations between the two countries to a new level. The German Economy Ministry announced in a statement that several Mittelstand firms, the small-to-medium-sized companies that form the backbone of the economy, had signed the deals with their Iranian partners during a landmark visit to Tehran by Vice Chancellor and Economy Minister Sigmar Gabriel. On the same front, Reuters reported that Mitsubishi Germany signed a contract to modernize a gas-fired plant, while plant constructor Keller HCW sealed an agreement to build a brickyard in Iran. Others that signed deals in Tehran included SMS group, a builder of steelmaking plants and INTRA industrial solutions, Reuters quoted the German Economy Ministry as announcing in its statement. 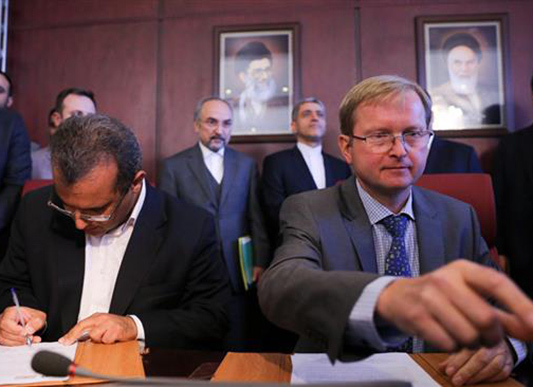 The central banks of Iran and Germany also agreed on technical co-operation, Reuters added. There was no detail on the size of the agreed deals. Gabriel – who is heading a 160-strong business delegation to Tehran – had earlier emphasized that Germany wants to help Iran push ahead with reforms, and promised to remind the United States of its commitment to reduce sanctions against Iran. This is Gabriel’s second visit to Iran since the country reached a deal in July last year to restrict certain aspects of its nuclear energy activities in return for the removal of some economic sanctions that had been imposed on it for several years. Industrial giant Siemens AG and automaker Daimler AG are expected to be the first German firms to benefit from opportunities in Iran after the removal of the sanctions, Reuters said. Nevertheless, they are proceeding carefully and only after legal reviews. The German banking sector has been reluctant to underwrite business deals for fear of falling foul of remaining US sanctions imposed on Iran.